Swedish husband and wife Alexander and Alexandra Ahndoril are the authors of the internationally bestselling Joona Linna series. 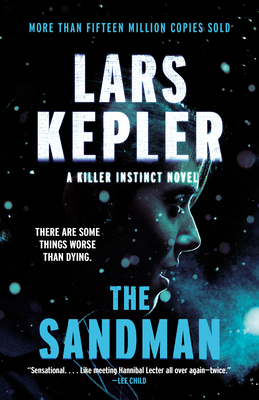 It's been five years since we've had the pleasure of new novel in the US and "The Sandman" was well worth the wait. Gut-clenching Nordic crime at its best, atmospheric and populated with complex, compelling characters. The chilling story of an insidious serial killer and the two brilliant detectives who must try to beat him at his own game. An emaciated young man named Mikael is found wandering outside Stockholm. Thirteen years earlier, he and his younger sister went missing, presumed to be victims of Sweden’s most notorious serial killer, Jurek Walter, who is now serving a life sentence in a maximum-security psychiatric hospital. But Mikael tells the police that his sister is still alive and being held by someone he calls the Sandman. Detective Joona Linna sacrificed everything to capture Jurek, but he always thought that Jurek had an accomplice. Any chance of rescuing Mikael’s sister depends on getting Jurek to talk, and the only agent capable of this is Saga Bauer, who will have to go deep under cover, and find a way to get to the psychopath before it’s too late.